Assigning members to an email queue offers emails entering the queue. The queue routes emails based on the members' skill set. Use the Phone Queue, Members tab to add or remove agents . 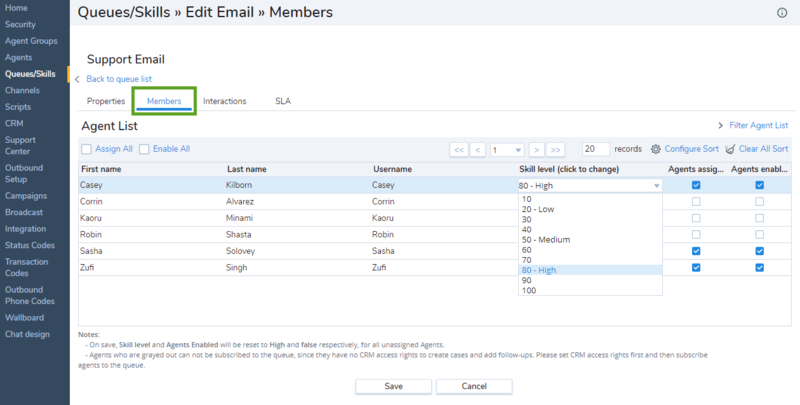 Select an email queue and click Members tab. A list of existing agents appear. Click Assign All to assign all the agents to the queue OR select the desired agents individually. Choose the skill level of the agent from High, Medium, or Low. Skill Based Routing assigns an interaction to an agent with a higher skill level before offering it to agents with lower skill level. Select Enable All or enable the desired agents individually to activate routing of interactions from this queue to the selected agents. Choose High, Medium, or Low. Virtual Contact Center Skill Based Routing assigns an agent with a higher skill level to an interaction before an agent with a lower skill level. To activate routing of interactions from this queue to an agent assigned to the queue, select Enabled.